King County and the city of Seattle should resist calls to soften helmet rules, especially for the disastrous Pronto bike-rental venture. KING County and the city of Seattle should resist calls to eliminate or reduce bicycle helmet rules. Helmets save lives. They reduce the severity of head injuries, which can be devastating physically and financially. 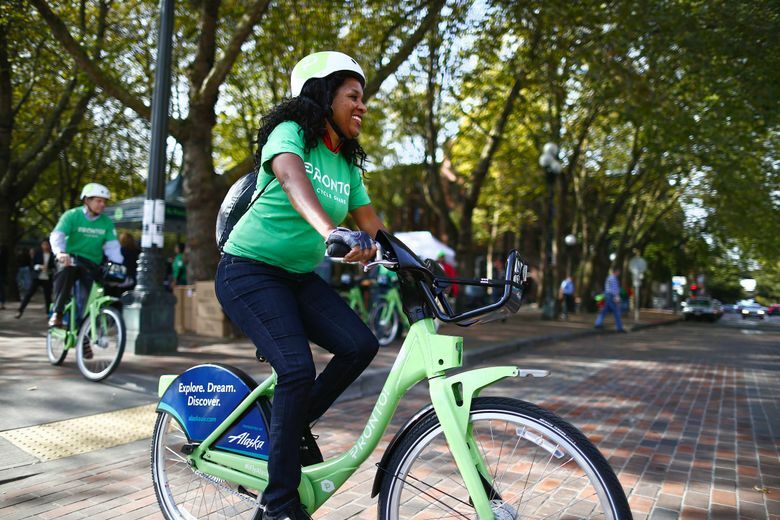 Recent suggestions that helmet rules should be eased because they hurt bike-rental businesses, such as Seattle’s disastrous Pronto venture, are ludicrous. This comes as the city prepares to spend millions upgrading the failing venture with faster, motorized bikes. If anything, motorized bikes increase the need for mandatory helmets. Helmets are important even on regular bikes. They reduce the risk of head and brain injuries in the event of a crash, according to the Centers for Disease Control and Prevention. The agency says more than 900 bicyclists were killed and 494,000 went to emergency rooms because of bike accidents in 2013. Crash-related injuries to bicyclists are expensive, as the recent string of million-dollar-plus payouts to injured cyclists in Seattle attests. Nationally, they resulted in lifetime medical costs and productivity losses of $10 billion in 2013, according to the CDC. Influential studies by Seattle experts found helmets could reduce bicycling head injuries by two-thirds or more. Additional studies show helmet laws increase helmet use and thereby reduce head injuries. Even so, there are persistent calls by some cycling advocates to reduce or eliminate helmet laws. Like motorcyclists opposing helmets and drivers objecting to seat belts, they argue that the inconvenience of helmets limits the growth of cycling, and safety gains are overstated. These “helmet deniers” point to skeptical reports among reams of helmet-safety research and haggle over the degree of safety achieved by helmets and legislation. They also pepper the internet with opposition and citations, creating an impression that helmet benefits are unclear. That’s incorrect, according to Dr. Fred Rivara, a professor and vice chair of academic affairs at the University of Washington Department of Pediatrics. Rivara, who was founding director of Harborview Injury and Research Center, did early research proving the safety benefits of helmets. That supported the proliferation of helmet laws in the 1990s, including King County’s 1993 law. “There’s pretty clear evidence wearing helmets is protective and helmet laws increase helmet use,” Rivara said. Rivara is among a cluster of renowned experts in head-injury prevention in Seattle. They’re part of the area’s strong history of public-safety leadership, which also includes Medic One’s pioneering life-support services. In passing its helmet law, King County cited their work and its own medical examiner and death-review data, showing that half the local bicyclists killed around that time weren’t wearing helmets and 80 percent of children killed weren’t wearing them. Safety continues to be a local priority. Seattle Mayor Ed Murray and the City Council recently emulated other cities in cutting residential speed limits to 20 miles per hour in the name of safety. The few seconds it takes for the relatively small number of cyclists to don a helmet are negligible compared with the cumulative inconvenience and delay that lower speed limits create for hundreds of thousands of drivers. If safety is paramount, helmet laws must remain and also be enforced. There’s no justifiable reason to soften King County’s helmet law, especially not for Pronto. Seattle’s quixotic bike-rental business isn’t worth another dollar, much less a policy change that risks a single additional head injury.